Don't Tax Our Health Benefits! Solidarity-Remeber Veterans and Give Thanks! In my reporting, I regularly travel to banana republics notorious for their inequality. In some of these plutocracies, the richest 1 percent of the population gobbles up 20 percent of the national pie. Nicholas Kristof addresses reader feedback and posts short takes from his travels. But guess what? You no longer need to travel to distant and dangerous countries to observe such rapacious inequality. We now have it right here at home — and in the aftermath of Tuesday’s election, it may get worse. The richest 1 percent of Americans now take home almost 24 percent of income, up from almost 9 percent in 1976. As Timothy Noah of Slate noted in an excellent series on inequality, the United States now arguably has a more unequal distribution of wealth than traditional banana republics like Nicaragua, Venezuela and Guyana. C.E.O.’s of the largest American companies earned an average of 42 times as much as the average worker in 1980, but 531 times as much in 2001. Perhaps the most astounding statistic is this: From 1980 to 2005, more than four-fifths of the total increase in American incomes went to the richest 1 percent. That’s the backdrop for one of the first big postelection fights in Washington — how far to extend the Bush tax cuts to the most affluent 2 percent of Americans. Both parties agree on extending tax cuts on the first $250,000 of incomes, even for billionaires. Republicans would also cut taxes above that. The richest 0.1 percent of taxpayers would get a tax cut of $61,000 from President Obama. They would get $370,000 from Republicans, according to the nonpartisan Tax Policy Center. And that provides only a modest economic stimulus, because the rich are less likely to spend their tax savings. At a time of 9.6 percent unemployment, wouldn’t it make more sense to finance a jobs program? For example, the money could be used to avoid laying off teachers and undermining American schools. Likewise, an obvious priority in the worst economic downturn in 70 years should be to extend unemployment insurance benefits, some of which will be curtailed soon unless Congress renews them. Or there’s the Trade Adjustment Assistance program, which helps train and support workers who have lost their jobs because of foreign trade. It will no longer apply to service workers after Jan. 1, unless Congress intervenes. So we face a choice. Is our economic priority the jobless, or is it zillionaires? And if Republicans are worried about long-term budget deficits, a reasonable concern, why are they insistent on two steps that nonpartisan economists say would worsen the deficits by more than $800 billion over a decade — cutting taxes for the most opulent, and repealing health care reform? What other programs would they cut to make up the lost $800 billion in revenue? In weighing these issues, let’s remember that backdrop of America’s rising inequality. In the past, many of us acquiesced in discomfiting levels of inequality because we perceived a tradeoff between equity and economic growth. But there’s evidence that the levels of inequality we’ve now reached may actually suppress growth. A drop of inequality lubricates economic growth, but too much may gum it up. Robert H. Frank of Cornell University, Adam Seth Levine of Vanderbilt University, and Oege Dijk of the European University Institute recently wrote a fascinating paper suggesting that inequality leads to more financial distress. They looked at census data for the 50 states and the 100 most populous counties in America, and found that places where inequality increased the most also endured the greatest surges in bankruptcies. Here’s their explanation: When inequality rises, the richest rake in their winnings and buy even bigger mansions and fancier cars. Those a notch below then try to catch up, and end up depleting their savings or taking on more debt, making a financial crisis more likely. Another consequence the scholars found: Rising inequality also led to more divorces, presumably a byproduct of the strains of financial distress. Maybe I’m overly sentimental or romantic, but that pierces me. It’s a reminder that inequality isn’t just an economic issue but also a question of human dignity and happiness. Mounting evidence suggests that losing a job or a home can rock our identity and savage our self-esteem. Forced moves wrench families from their schools and support networks. In short, inequality leaves people on the lower rungs feeling like hamsters on a wheel spinning ever faster, without hope or escape. Economic polarization also shatters our sense of national union and common purpose, fostering political polarization as well. So in this postelection landscape, let’s not aggravate income gaps that already would make a Latin American caudillo proud. To me, we’ve reached a banana republic point where our inequality has become both economically unhealthy and morally repugnant. I invite you to comment on this column on my blog, On the Ground. Please also join me on Facebook, watch my YouTube videos and follow me on Twitter. A version of this op-ed appeared in print on November 7, 2010, on page WK10 of the New York edition. Connect with The New York Times on Facebook. Ads by Google what's this? Solution To End Financial Crisis! The Hollywood Issue - 14 Actors Acting - James Franco, Natalie Portman, Matt Damon and More - Video. 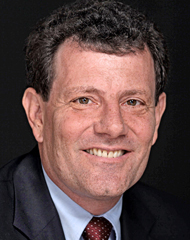 Nicholas D. Kristof: Framed for Murder? See the news in the making. Watch TimesCast, a daily news video.